Solid plastic 8″ square rain shower head distributed by GV. 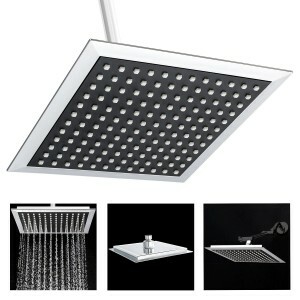 Transform your bathroom with this sleek rain shower head! You won’t believe your eyes and neither will your next house guest. The entire shower head body is made of solid durable plastic, with chrome finish and features a black center look Square shape, 8″ sides with thin design. Also features a swivel adapter which allows you to angle the shower head during use Rubber nozzles allow for easy cleaning if clogged by debris. Water comes out of nozzles to create rain fall experience. One year warranty. Item Model Number JX-722 Size 8" x 8"